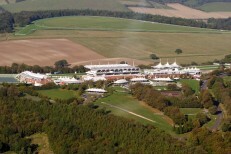 Goodwood Racecourse has been at the forefront of British flat racing for more than 200 years. Often described as ‘the most beautiful racecourse in the world’ the setting couldn’t be better for a memorable day’s entertaining at the internationally renowned venue. Steeped in English tradition and delivered in Goodwood’s signature style, every year the faithful and fashionable return to the Sussex Downs for racing at it’s absolute best. Goodwood’s consistently high standards, attention to detail and sense of fun combine to ensure an occasion your guests will always remember. You and your guests can savour Goodwood’s unique atmosphere in style and comfort, whilst enjoying superb cuisine, first class service and a spectacular view of the racing action.